Susceptible is Geneviève Castrée’s first full-length English-language graphic novel. The multi-disciplinary artist and Quebec native has crafted a moving tale about Goglu, a bright, dreamy little girl who has a less than ideal start in life. As the title implies, she is sensitive, but Vulnerable would have also been a fitting title. Her mother like droves of other young people in the early eighties had gone out west to make some quick money during the Alberta oil boom and experience her first adult adventure. Her mother, Amère, which aptly reflects her bitterness, returns to Quebec alone to give birth, but family support is not forthcoming. The youngest of 16 children, Amère didn’t receive much herself in the way of parenting. Goglu is a latch-key kid from the time she starts school. Her mother sets an alarm clock so that the six-year-old knows when it is time to get ready and catch the bus to school. Amère is a struggling single mother who still parties like most 20-year-olds, but strictly on the weekends. She eventually meets her significant other, Amer, and they move in together, but Amer in no way assumes any fathering responsibilities, and he resents Goglu. The weekend parties continue, and too ashamed to invite friends over to her house, the girl finds herself alone, a lot. As a teen, Goglu is troubled by her mother’s increasing dependence on alcohol. 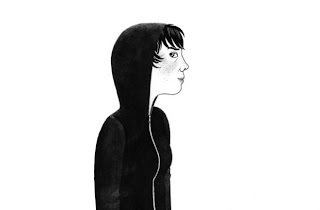 Geneviève Castrée shows genuine talent as a graphic novelist and has created a compelling story. Particularly innovative is the circular panel she uses to illustrate an intense argument with her mother. We can all attest that arguments tend to be circular in nature, often returning to the original accusations. Of all the books I’ve read in the last few years, I found Susceptible the most heart-wrenching. Goglu, like many unwanted children, internalizes her mother and stepfather’s resentment, which unsurprisingly results in her own anger, depression and self-imposed alienation. Although it would be easy to point the finger at Amère for being a poor mother, she too was an unwanted child. As a single-parent with few resources, she chose to live with another wage-earner to make life and decision-making a little easier. In her desperation, she not only chose a man she didn’t love, but also one who had little patience for her daughter. A lot of people will find this a harrowing read, but for many this will be validation for their own experiences growing up in cash-strapped homes with ill-equipped parents. Susceptible should be on the bookshelf of every teacher, guidance counsellor, social worker and planned parenthood advocate. I applaud the publisher for taking this risk on a story that could potentially help a lot of people, both young and old. : Susceptible by Geneviève CastréeTweet this! Excellent review. Sounds like an intriguing book. I like the premise of history repeating itself from generation to generation. This book floored me. We often talk about an unwanted children, but rarely how it feels to grow up as one. Any time before Goglu's birth, there were legions of unwanted children, "the mistakes" as we were called. This has so much to do with the availability of abortion. We often wrongly assume that if abortion is legal, it is accessible. In Amere's case, abortion was legal at the time, but completely inaccessible to a woman living in the bush. There's also an amazing excerpt on Goglu remembering the Montreal Massacre, and how frightened she was as a child. Again, this is an even that even 25 years later is still showing its profound repercussions on generations later.